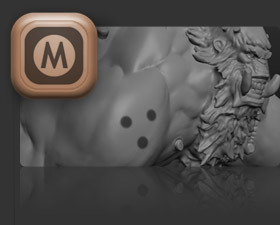 Because GoZ™ is a ZBrush feature, the files necessary for GoZ™ to operate are included with the current GoZ™ update for ZBrush which may be downloaded from the plugins page. 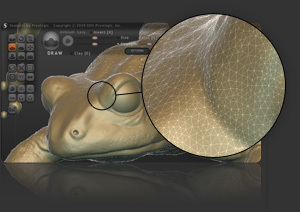 * The GoZ™ feature will only work if ZBrush and GoZ™ have been installed on your computer. 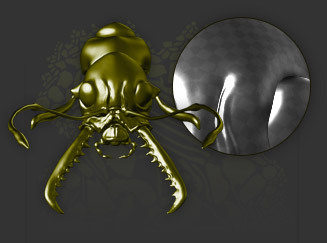 Automatic subdivision allows for "rough to fine" detail sculpting. Start with a sphere and let your creativity take control. The straightforward toolbars will allow you to focus on your model without a cluttered workspace. 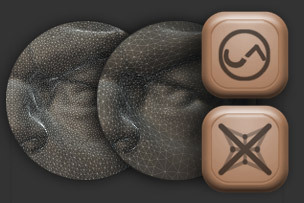 The controls in Sculptris are now similar to those in ZBrush, making it effortless to go between the two applications. 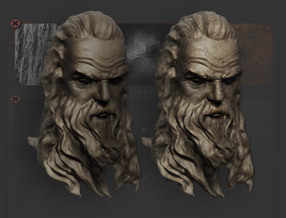 Automatic symmetrical sculpting on both sides of the model. Draw, Grab, Pinch, Crease, Flatten, Smooth, and more. Adding detail has never been so easy. 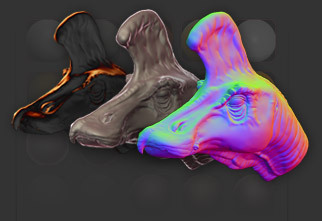 Reduce the amount of tris across your entire mesh or use the reduce brush to optimize a localized area. 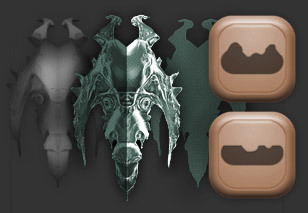 Customize your brushes with preloaded patterns. Protect areas of your sculpt while working. Easily simulate a wide variety of preloaded materials. 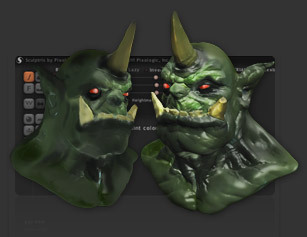 Sculptris automatically creates a UV map, allowing you to easily paint and texture your sculpt. Paint your textures in Photoshop and project them onto your model. 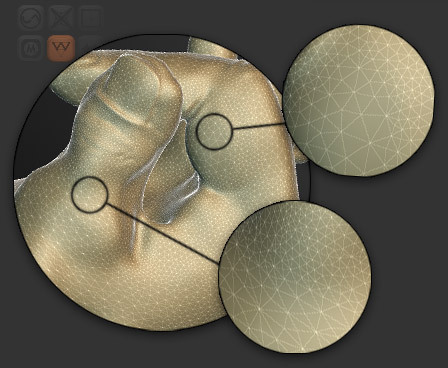 Create fine details in your model through texture alone. 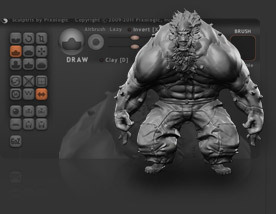 With its simple interface and focused toolset, Sculptris provides an excellent gateway into the exciting world of 3D. It's features are easy to learn, even for someone with no experience in digital art, yet robust enough for creating base models that can then be refined in other applications. 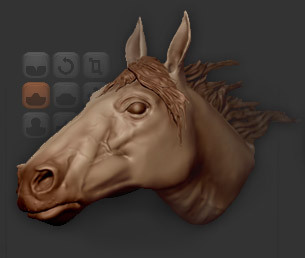 When you're ready to take art to the next level, the skills that you've learned in Sculptris easily translate to ZBrush. 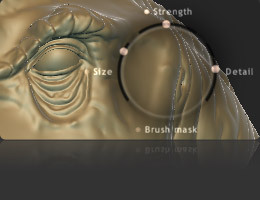 With greater depth and customization capabilities for everything from sculpting and brushes to materials and rendering, ZBrush has become the industry standard for highly detailed digital art in the fields of movies, computer games, illustration, product design and more. 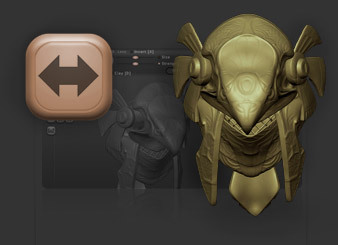 And everything you've created in Sculptris can be sent to ZBrush with a single button click!